"Slide" is made of one genuine leather braided strap in brown with magnetic clasp closure. 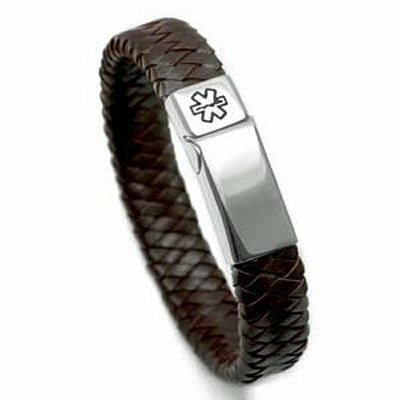 Say goodbye to difficult lobster clasps with the sliding, magnetized clasp on this braided leather and stainless steel medical ID bracelet! This bracelet fits a wrist of 6" to 6-1/2" only. No further discounts are available on this laser engraved product. WARNING: Please do not order is you have a Pacemaker! 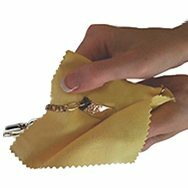 SIZING: Wrap a soft tape measuring around the wrist/ arm where you will wear your bracelet to get the correct wrist/ arm measurement. DO NOT ORDER IF YOU WRIST SIZE IS NOT LISTED HERE - This item not available for resizing. WARNING: Please do not order is you are wearing a pacemaker.